1. Preheat the oven to 200ºC, gas mark 6. Place the tomatoes in a roasting tin with the olive oil and crushed garlic. Season and roast for 15 minutes. 2. Meanwhile, place the mushrooms on a baking tray, stalk-side up. 3. When the tomatoes are ready, mix them into the ricotta and season. 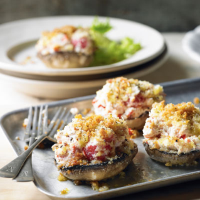 Spoon the mixture onto the mushrooms and sprinkle with breadcrumbs. Bake for 20 minutes until golden and crisp. Serve with the salad.